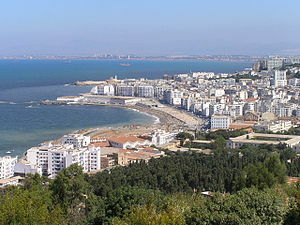 Is e prìomh-bhaile Algeria a tha ann an Algiers (Fraingis: Alger; (Arabais Algereach: الدزاير, Dzayer). Tha Algiers 945km air falbh bho Rabat (Maroco), 635km bho Thunis (Tuinisia), 1,019km bho Tripoli (Libia), 1,031km bho Valletta (Malta), agus 717km bho Mhadrid (An Spàinn). Tha e suidhichte ann an ceann a tuath na dùthcha, aig 224m os cionn ìre na mara. Chaochail Camille Saint-Saëns ann an Algiers ann an 1921. El Hadj M'Hamed El Anka: (1907 – 1978) Ceòladair. Andrée Esposito: (1934 -) Bana-sheinnadair Opara. Daniel Auteil: (1950 -) Actair. Assia: (1973 -) Bana-sheinnadair Opara. Air a tharraing à "https://gd.wikipedia.org/w/index.php?title=Algiers&oldid=529656"
Chaidh an duilleag seo a dheasachadh 14 dhen Ghiblean 2017 aig 01:39 turas mu dheireadh.